I met with a patient not too long ago who was vegetarian. When we were talking about the reasons he was struggling with his weight, his food budget surfaced as a concern. It wasn’t the amount that was the problem, but instead how he was spending it. “What is your monthly food budget?” I asked. Of course I asked how many people this amount feeds and he reported five, two of which were young children. When we started looking at where he spent the bulk of his money, “meat substitutes” and prepared vegetarian meals were, by far, where he was spending the majority of his food budget. I was 1) floored and 2) unable to produce a go-to veggie burger recipe on the spot. I was inspired after meeting with this patient. 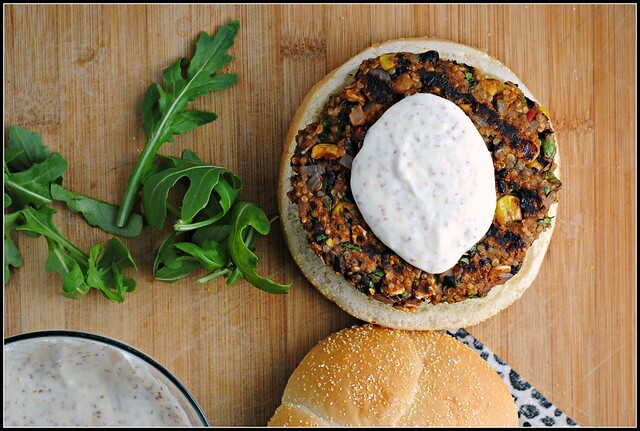 Inspired to not only to get this patient stretching his budget much, much further…but to land a seriously delicious veggie burger recipe to share. It is unfathomable to me as to how someone would fork over that kind of money before considering the option of cooking…it absolutely blows my mind. If you’re an avid vegetarian meal consumer, these are for YOU! 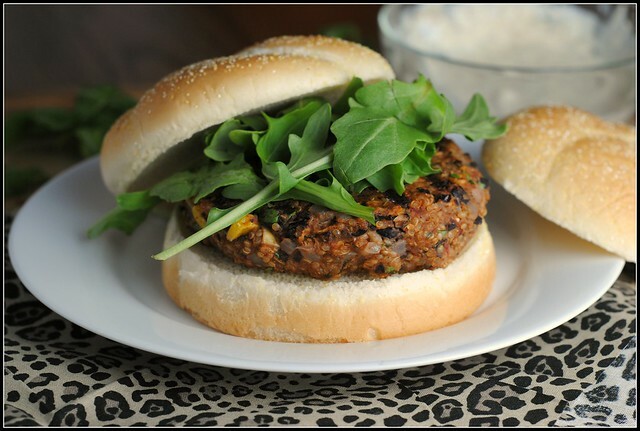 If you THINK you wouldn’t like veggie burgers, this recipe is for YOU, too! It likely goes without saying, but Mr. Prevention was NOT happy about this meal. He popped in a frozen Jack’s pizza but wouldn’t you know he was piecing apart one of these patties before it was even off the griddle. He was sampling and sampled again. I think he tried a third bite before admitting he was wrong…admitting that, once again, he falsely judged a vegetarian recipe. This recipe is going in the mail straight to that patient. I hope he takes the bit of effort required to make these because “the juice is worth the squeeze”. Don’t forget the yogurt sauce…so good, especially with the spicy Southwest flavors of the burgers. I did serve these on a bun, but you could certainly eat them solo. Veggie burgers just got taken to a whole new level and the nutrition stats couldn’t be more impressive (7.2 grams of fiber and 4.3 grams of fat per burger!). Stir in the tomato paste, egg, corn, cilantro, chipotles, cumin and remaining 1/4 teaspoon salt. Stir in the cooked quinoa, oats, and oat flour until well mixed. Form the mixture into 6 equal patties, compacting them well with your hands as you form them. Place the patties on a baking sheet, cover them with plastic wrap and refrigerate for at least a few hours or overnight. To make the yogurt sauce, stir the yogurt, honey and mustard together in a small bowl. When ready to eat, preheat the oven to 400 F or heat a griddle to medium-high heat. If baking, spray a baking sheet with nonstick cooking spray and place the patties on the sheet cook 10-12 minutes until the patties are golden brown and crispy. Carefully flip the over and cook another 10 minutes. If using a griddle, heat 4-6 minutes per side or until slightly golden. Serve patties with the yogurt sauce. Our 4 Christmases have come to an end. Family, friends, and husband were far too generous. We are heading home with a more-packed car, an exhausted bulldog, and only 2 work days until the weekend 😉 T’was a very merry Christmas indeed! Looks delicious, Nicole. NExt step is actually getting this guy to MAKE the burgers! I I guess he could always make a triple batch, and freeze them, right?! They look awesome. For those who can their own beans or start from dried, one 15 oz can beans = 1.75 c. Awesome recipe! Double or triple the chipotle and serve on a corn tortilla with a poached egg for sort-of huevos rancheros. Thank you. These look like great holiday detox food. And they’re so pretty, too! I’m always looking for new black bean burger recipes. This one looks awesome! wow, his food budgeting seems ridiculously high while making food at home is so much healthier and cheaper. 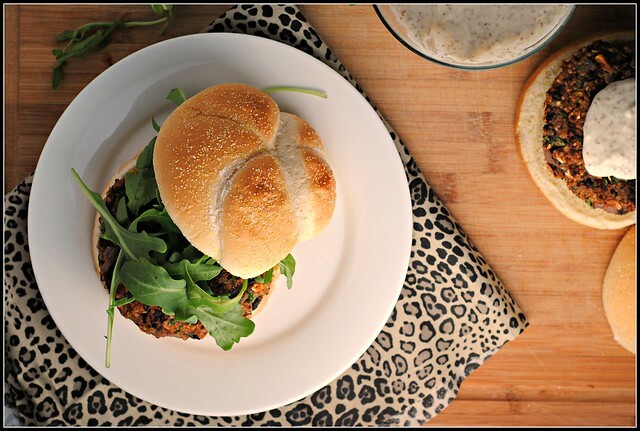 Loveeee veggie burgers and I made similar ones not too long ago and its great with salads, simply freeze it and its good next day for your meal 🙂 I am so glad you are taking the initiative to send the recipe to him because he will appreciate it. This burger sounds awesome! I will definitely need to try this and I am sure my meat eating (although he enjoys meatless meals often) would approve. Glad you had a nice time celebrating Christmas with friends and family. I guess I should consider myself lucky that I know of so many vegetarian bloggers! When we do no-meat weeks in our house, our food costs are usually much lower! These look so very appetizing! My husband and I are tending towards reducing the amount of meat we eat, and it sounds like this will be perfect! He does the same thing with vegetarian recipes, so perhaps this one will help turn him around as well! 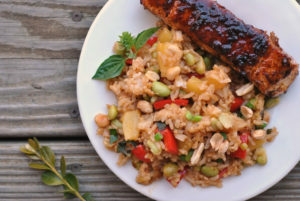 Do you think the recipe would work with millet replacing the quinoa? Hi Natalie! I think so because you mash up the beans and have the egg to help hold it all together 🙂 Enjoy! Can I use diced tomatoes & green chilies? Trying to make healthy recipes for a diabetic. Hi Melissa! My only concern would be too much moisture and the burgers not holding shape. If you do use, I would squeeze out all excess moisture from the tomatoes. Hope it turns out well! These look delicious! I love the yogurt sauce too….a nice touch! Beautiful burger, and site! I just cooked some quinoa so I will try this. I am a midwife and am trying to get a nice collection of recipes on our website that are healthy and simple and appealing to families with small kids…like this recipe! I’d like to encourage you to submit it (and as many others as you like) to our recipe contest. If we post your recipe(s) on our site (which will if you submit them…your recipes are awesome), we will post not only your name as you enter it but also a link to your blog. PS – Any readers of this blog are also encouraged to enter the contest! I definitely agree that this recipe is a keeper. I’ve been looking for years for a decent veggie burger that didn’t come out of a box. This one ends my search! I doubled the chipotle and couldn’t even really tell it was there. Will prob do 3 or 4 chipotles next time. Thanks for sharing! I bump up the chipotles, too…I love that spice! Glad you enjoyed these, Annie! Could you freeze these? And would you freeze before or after cooking them…not sure what would be best?? Absolutely! I have some in my freezer now. I would definitely cook first, then freeze. Why would you need to cook before freezing? They hold together better, but you could certainly do either way! I have made them twice and quadrupled the recipe. I freeze them before cooking, hoping they will retain more of their moisture. A handy little burger press and wax paper squares makes them so easy to separate when frozen. These looked so wonderful thought I would give them a try. We are not vegan, just wanted something meatless and different for lunch. LOVED them! Each burger was just over 1/2 cup of the mixture. I used 1/2 tsp Chipotle powder instead of the pepper and sauce. I also used 1/4 cup egg substitute in place of the egg. These held together perfectly. Even my husband loved them! Said he wanted them for lunch again tomorrow. Thanks so much for sharing! These were so simple to make. Just made these and they are so so Yummy!!! Thanks for sharing this recipe. Donna: The oatmeal does get soft. You can use either the quick or old fashioned oats. Quick question – why do they need to be refrigerated? Is it possible to just make and cook? Hi Brett! The refrigeration is to help the egg and oats congeal so the patties hold together. These look good… can you use regular flour or whole wheat flour instead of oat flour? I just made these, I was so excited to try them that I couldn’t even wait for them to solidify in the fridge. I’m in love, these are better than restaurant veggie burgers! I can’t wait to eat another one with some baked sweet potato fries on the side. Thank you for sharing! So glad you loved them, Brenda! I hate veggie burgers! They are usually so bland and boring, but not these babies. These are Amazing!!! My whole family loved them. Will make over and over again. Thank you for sharing your recipe. I made these for dinner with some homemade (baked) French fries. They are SO GOOD. Thank you for this recipe! Just wondering if you can replace the egg with something else? Husband can’t eat dairy, egg or gluten. They look delicious! We have egg and dairy allergies in our house. Do you have suggestion for leaving the egg out/replacing the egg? Love this recipe! You could also save $ by using dried beans for the recipe instead of canned ones. I was wondering if they would be ok if they were only in the fridge for 2 hours? What exactly is chipotle in adobo minced? Does this recipe call for one can or is it something else? Katein, chipotle peppers in adobo are spicy peppers in a sauce that come in jars in the Mexican foods section. They comes as peppers that need mincing and the sauce is called adobo sauce…it comes in the can with the peppers. I hope that helps! Could you sub jalapeño minced instead if you we’re unable to find the adobe peppers? I made these this evening, they were wonderful! I made only one change, I made a honey-lime yogurt sauce instead and topped with avocado. Made these and LOVE them!! Work SO good cooked and frozen for a quick lunch. Do you happen to know the WW Points or Points Plus for these? I made these for dinner last night and served them on buns. They were good, but not to die for. Today I served the leftover burgers wrapped in a lettuce leaf instead of a bun & OMG what a difference! LOVED them and can’t wait to make them again! I’m anxious to try these after I’ve gathered all the ingredients. To freeze these, do you recommend freezing them before, or after, they’ve been cooked? Thank you for sharing the recipe (which I discovered on Pinterest)! I made these last night and they were delicious! I coked all 6, but froze 3 of them. How do you suggest reheating the frozen patties? Do you defrost before cooking, or pop them in the oven frozen? These were so good! I doubled the recipe so I would have some to freeze, used whiole wheat flour instead of oat (it’s what I had on the shelf), and used 4 chipotle chilis since we like spice. I chilled for 2 hours and they stayed together just fine. Made the honey/lime/yogurt sauce another poster recommended (and hubby doesn’t like mustard anyway). Will definitely keep these in the recipe arsenal! Any suggestions on making these vegan? You could try a flax egg – 1 Tbsp ground flax with 3 Tbsp water (allow to sit and form a gel) and leave off the yogurt sauce. I have a fractured spine and am eating vegan to reduce pain and inflammation made worse by eating wheat, corn, dairy (including eggs and milk) and meat. How should I make the Quinoa veggie burger so that it can fit with foods in my diet. While I can eat black beans (that are organic), I do not want to eat potentially GMO foods, to put more stress in my life..
Do you have a suggestion for something to replace the corn with? I won’t eat corn unless it is organic/non-gmo (and I’m out) and don’t really digest it anyways. I would just leave the corn out…no biggie! I’m allergic to oats…is there something I could use in place of the oats? I see that regular or whole wheat flour is ok for the oat flour…but what about the oats? Hmmm. I would try breadcrumbs. Made a double batch this evening – replaced the corn with red pepper and used a homemade chili powder instead of the chipotle (which I don’t know where to find). Nice but didn’t absolutely love it in a bun… for the leftovers I’ll eat them on top of salad, with the sauce, I think. I just wanted to say thanks for the recipe! I have a really hard time digesting beef, and try to stay away from soy products, so non-soy veggie burgers get me really excited! I have these chilling in the fridge right now, and in addition to the corn, I added some cubed zucchini (cubed to be about the same size as the corn). I can’t wait to try them! Hi I was wondering where all that cholesterol comes from. I am looking for cholesterol free foods and hope I can cut something out of the recipe to make it cholesterol free. Is it just the yogurt sauce? Thanks for posting this recipe. Hi Shannon! The cholesterol comes from the egg. I made these last week for a friend, they were AWESOME! So good that I just mixed up my second batch, I will be freezing some of these to have on hand for a quick meal. Thank you so much for posting this! Loved them! Ohhh, I so cannot wait to try this recipe…going to try and make some tomorrow!! If I cannot find the coconut yogurt to make the yogurt sauce I’ll try it w/ avocado. That should be super yummy…and if I can make the sauce I’ll try the avocado anyway. Thank you so much for this recipe. GOD Bless you and your family! So i found this recipe on pinterest and I’ve been so excited to make it! I have plans to make these for a group of my friends in a few weeks and i tested them out today to see if they’d be good. They were so good! They were guilt free, yummy burgers! I made the yogurt sauce but instead of dijorn mustard i used brown spicy mustard, so i don’t know how badly that messed up the flavor, but I was not a huge fan, however my brother liked it. Thank you so much for sharing your recipe, I really enjoyed it! OMG YUM. Just had these for dinner and they are a-maze-balls. It’s been hard to find meatless meals that the Man will eat without complaints, but he said these were a 9.2/10…he deducted points because they didn’t have cheese or bacon 🙂 The only thing I might change the next time would be to add some shredded zucchini or carrots to bump up the veggie factor and add some more moisture. Thanks for the recipe, definitely a keeper!! How do you suggest we reheat the frozen ones? Straight out of the freezer or defrost overnight? Thanks again! I am on Weight Watchers and these looked amazing – I put them into the recipe builder and they are only 4 points per patty – made a batch and actually got 7 patties out of the mixture! Can’t wait to eat them! Hi there, these look great. Is it absolutely necessary to use the oats and oat flour? What is the purpose of that? It is a binder to help them hold together (and also keep them gluten-free). You can use wheat or all-purpose flour in place of the oat flour 🙂 Thanks, Marie! great recipe. Used whole wheat buns and used 3 chipotle’s because we like a little more heat. When she says big bowl she means it. I used a mixing bowl and wish I had used a larger one. We cannot eat Quinoa – what may we substitute instead? i just made these on portobello mushrooms and seriously, the flavor of the patty and the sauce are so delicious with the mushroom! Thank you for sharing this! I just made these on portobello mushrooms. Seriously, the flavor of the patty and the sauce are so delicious combined with the mushroom! Thank you for sharing this! I just finished doing the mix and have them in the freezer. I don’t consider myself such a low budget grocery shopper but I think I spent way to much on this recipe and took me way too much time to just get to the mix. Not sure if I will do them again. I will wait until I taste them tomorrow. By far the best veggie burger recipe I’ve ever tried. I even impressed my meat eater friends with this! Will make again and again! By far the best veggie burger I’ve ever made! I even impressed my meat eater friends! Will make again and again! Made these tonight and they were really good. Turned out just like the picture. So Good!!! I just made it for my family and they loved it! i am trying to eat healthy and we ate the veggie patty with guacamole and sweet potato fries. So amazing. I have made it twice now! These are indeed delicious! I swapped the chipotle with sundried tomatoes, and the frozen corn with mixed vegetables (pantry = bare), but they were still absolutely delicious and satisfying! The cumin is key. Had them on whole wheat buns with Sriracha and organic ketchup. These were absolutely delicious! My fiance and I fall into the category of “people who think they don’t like veggie burgers”, but when I read the ingredients list it sounded pretty good. We made them last night and we are both new fans! Thank you! Glad you guys enjoyed them, Heather! These are the BEST veggie burgers I’ve ever made. I didn’t change a thing, I just made a batch and tossed them in the freezer with squares of wax paper in between. They cook very well from frozen, I’ve cooked them on the barbecue on a square of oiled foil and baked them in the oven. We didn’t have black beans so we used northern white beans. We didn’t want to wait for refrigeration time so we put in the freezer for 15 min then refrigerator for about 20. They turned out fantastic! It looks delicious and I would certainly try it. However, the problem in today’s life is that we all become complacent and lazy when it comes to plan for a healthy diet which requires shopping for the right foods and cooking in the right way. I am the greatest culprit. It takes effort and discipline to change bad habits and go on a healthy path. Still, it is no excuse, so I might as well start by making myself a black bean and quinoa burger, better than a BK. I love these! Made them 3 times so far. 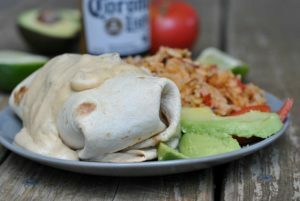 I really like them over rice with grilled veggies or cutting them in half and putting in a corn tortilla with taco toppings. Yum! Glad you love them, Sarah! seriously, I was a bit skeptical of “veggie” burgers, not exactly a veterinarian. but had my share of cardboard tasting patties… these were amazing! Glad you loved them, Kasia! I did a taste test of store bought Boca veggies burgers vs. this recipe and boy were you correct. The store bought veggies burgers cannot compete as far as texture and natural ingredients, I will definitely be grilling this while the summer season is still around! Usually I’m not much of a veggie burger eater, but DANG these were good. It took me a minute to realize that what I was eating wasn’t a traditional burger because the texture was so legitimate. I’m going to put this in my toolbelt for future use and will definitely be coming back to scout more of your recipes :). 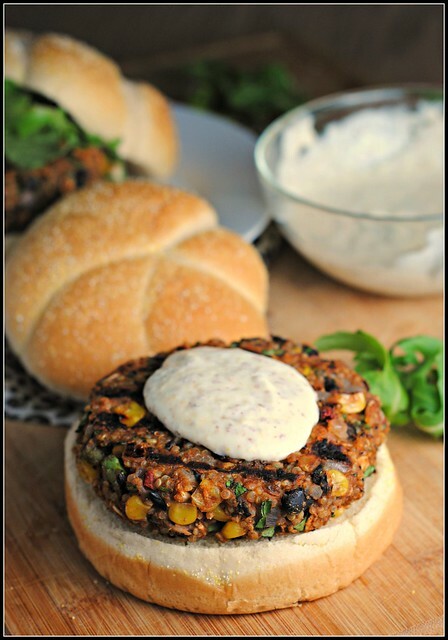 These by far are my favorite black bean burgers! The quinoa is the magic ingredient. This is so flavorful and I never hear a word when they are served… quiet is a good thing when it comes to a meal! Best compliment ever! Never any left over and all I hear from the family is ummmmm! I am a meat eater but these burgers don’t make me miss the meat at all. Bravo on this recipe! Thanks, Christina! So glad you love them! You shared the right information that i was looking for. I love reading through and found helpful information you shared in this article. Indeed the black bean is a good substitute for the meat. This is a very healthy burger.